I have no idea why there were so many caterpillars this year! Normally, I have 5 or 6 at a time, perhaps 2 or 3 times a year. Was it the heat? The unusual mugginess we’ve been having this year? Who knows! 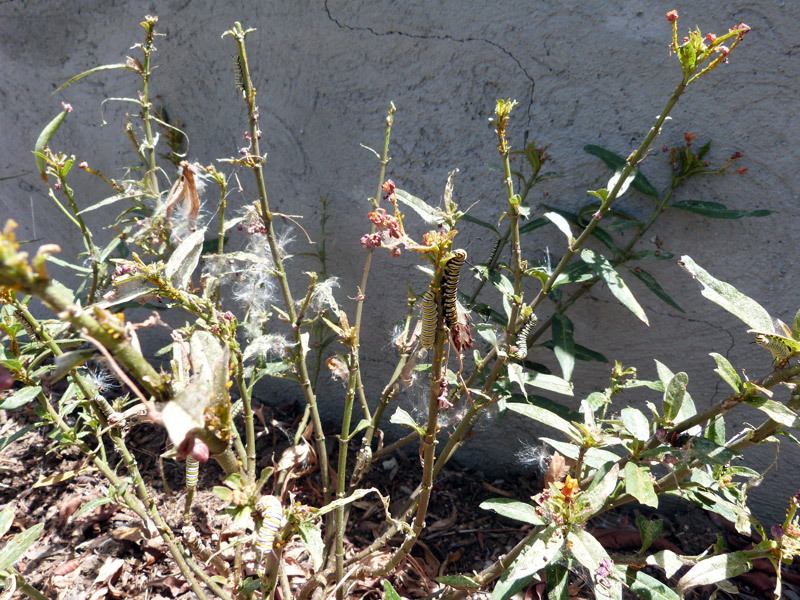 At any rate, there were really too many caterpillars for the plants to support. 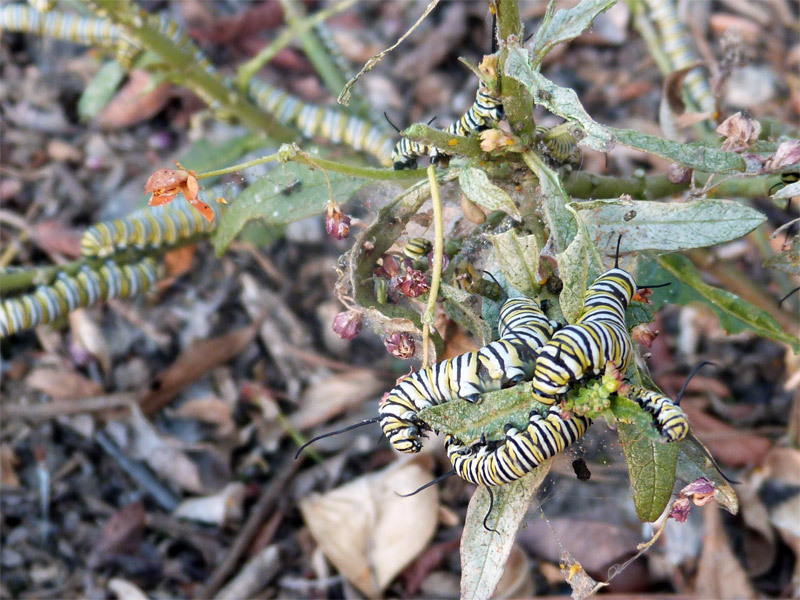 They ate the milkweed plants down to the nub of each leaf, and soon began eating the stems. 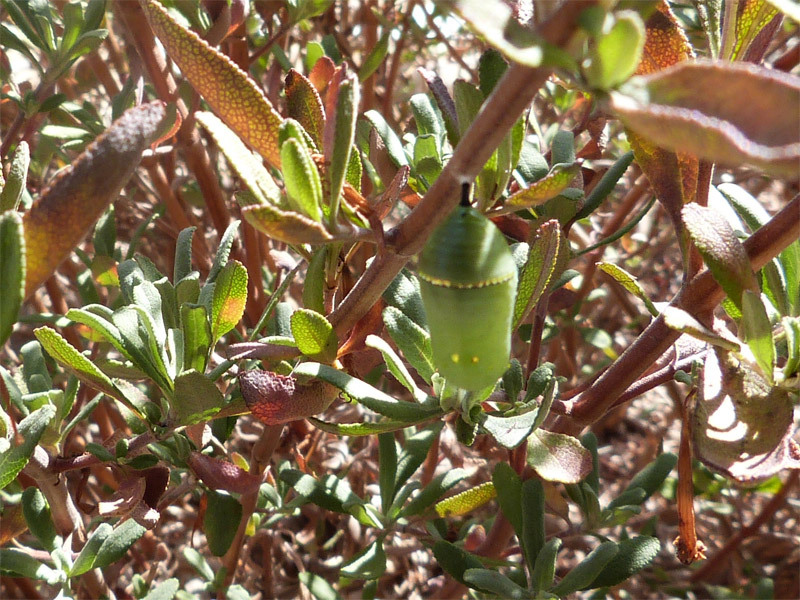 Many of them were too immature to pupate at this point. 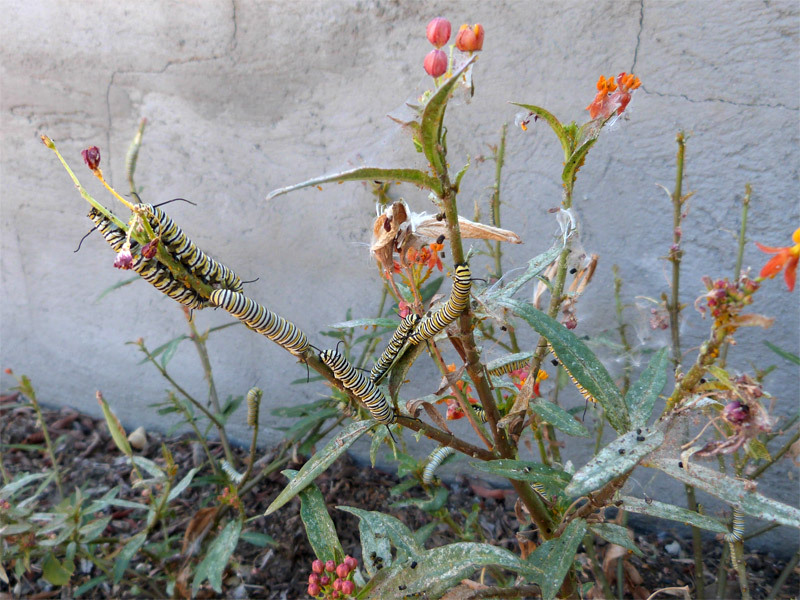 Some started crawling away from the plants, but I knew they were not ready to pupate — they were looking for another milkweed plant. 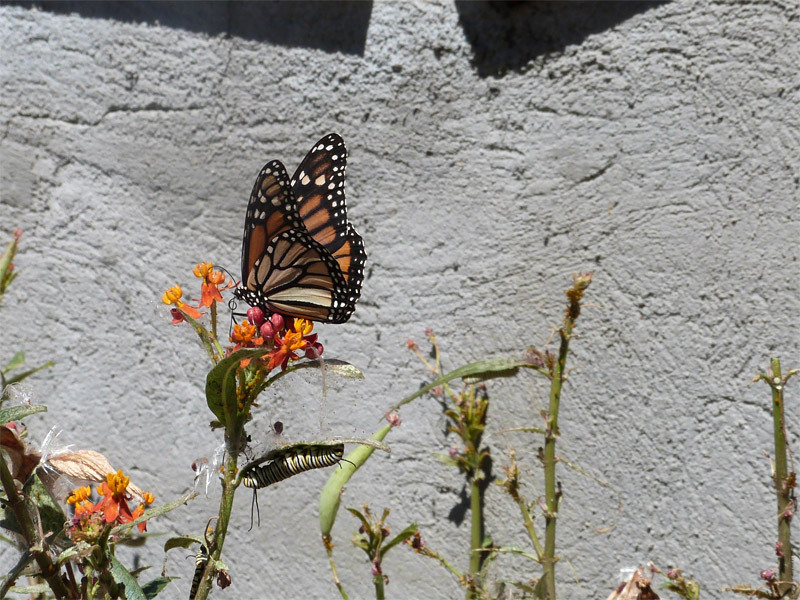 I was able to move a few of them to a small milkweed plant a few feet away that the butterflies had ignored — probably because it was too small. 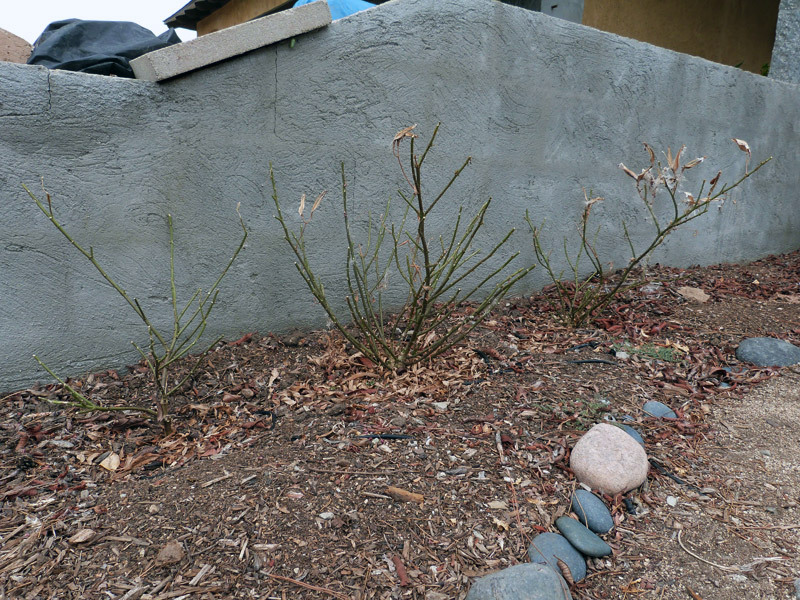 In addition, I moved some of them to the three new, small plants on the side of the house. They ate those, too, down to the stems. In the end, many of the caterpillars that were too small ended up perishing, though I don’t know where or how in most cases. They simply disappeared. 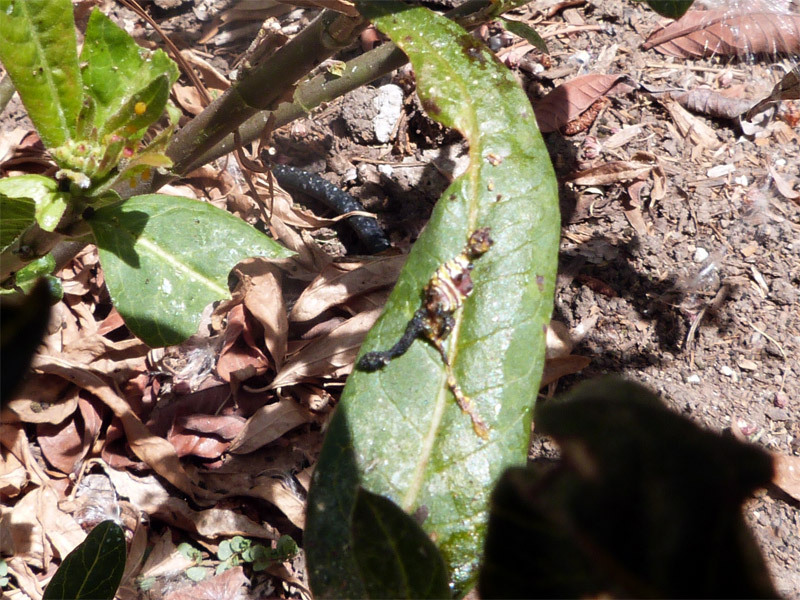 A few of them were attacked and killed by ants when they came down to the ground from the small milkweed — it was, apparently, located in the middle of an ant path. 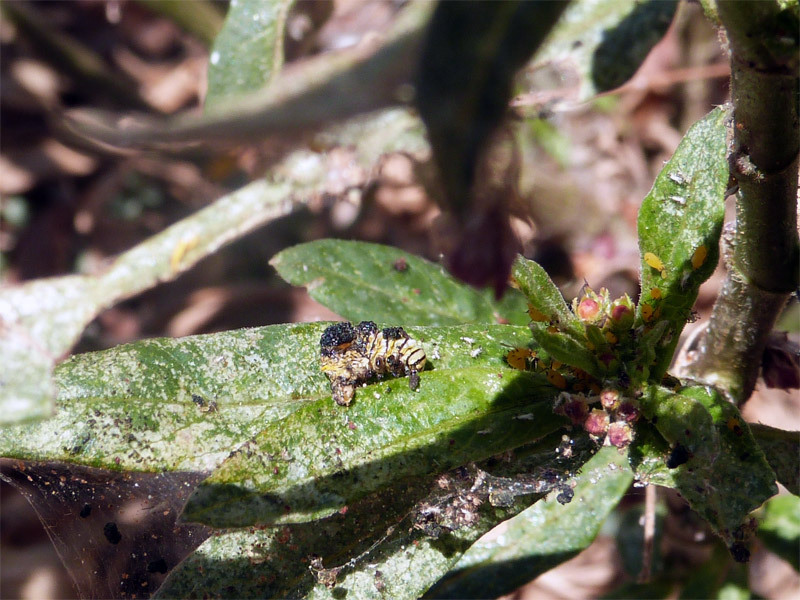 Some others seemed to simply succumb to the heat; I found dead caterpillars exuding fluid in a couple of places. The others met their end hidden from my sight. 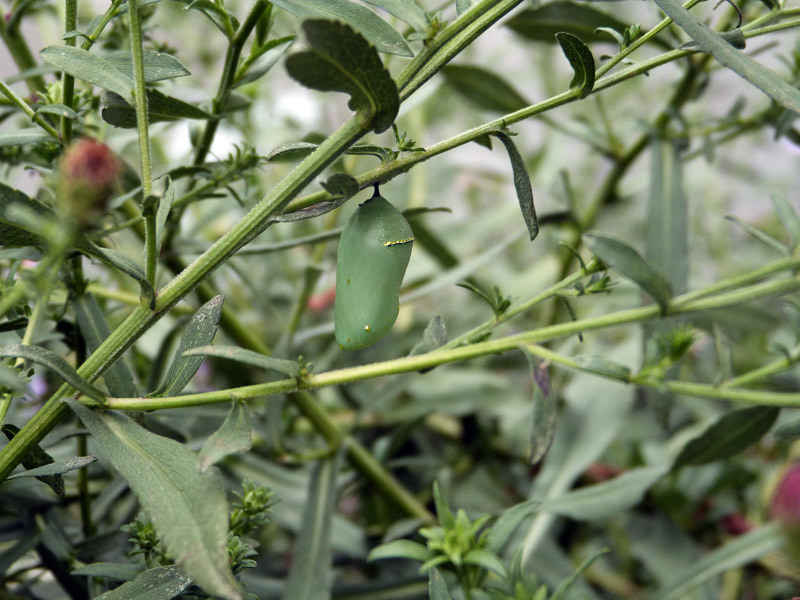 The lucky ones — the ones that had reached full maturity before the leaves gave out — went off to find places to pupate. 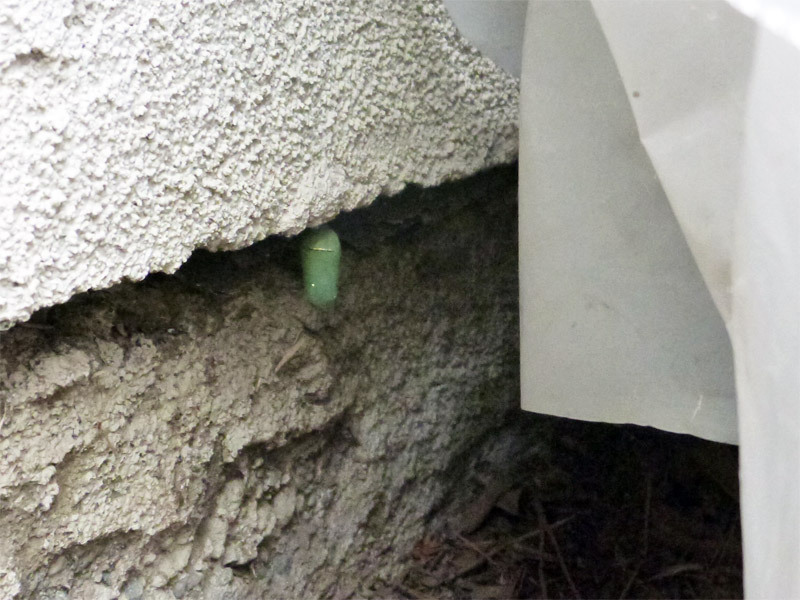 One of them chose an unfortunate spot: this caterpillar had been one of the ones i had moved to the side of the house, and he ended up climbing the stucco wall of the house to try to find a pupating spot. 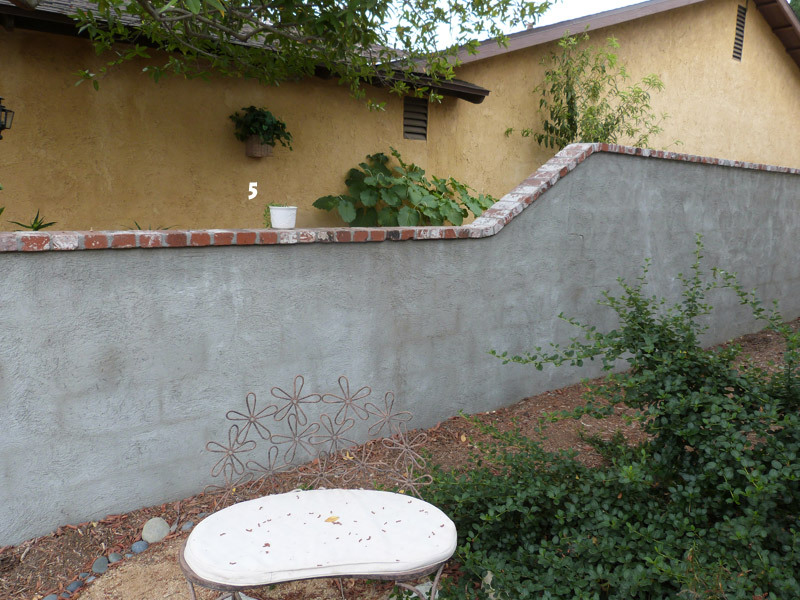 Unfortunately, he could not find a horizontal surface — alas, there really aren’t any on that wall — and he formed the “J” on the vertical wall, hanging off at an angle. 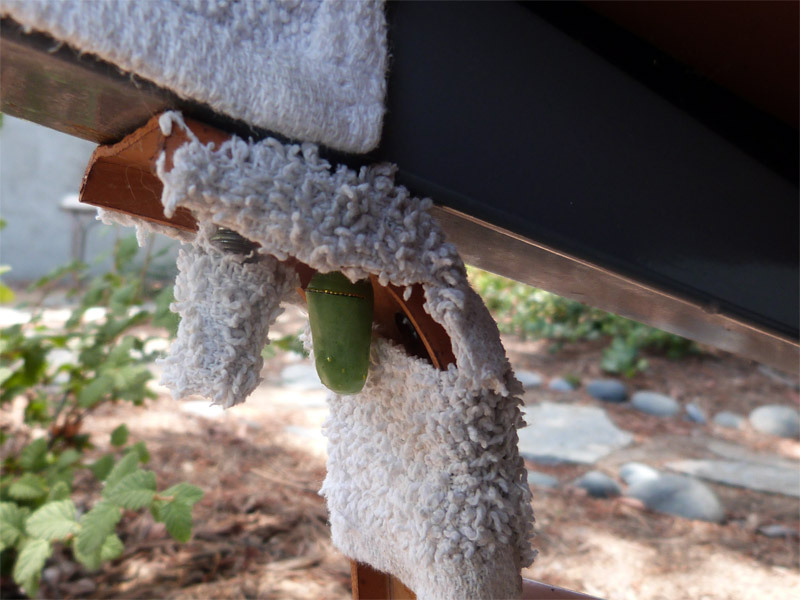 One of my previous caterpillars had done a similar thing a few weeks ago, and encountered no problems — but that caterpillar was attached to a wooden part of the wall. 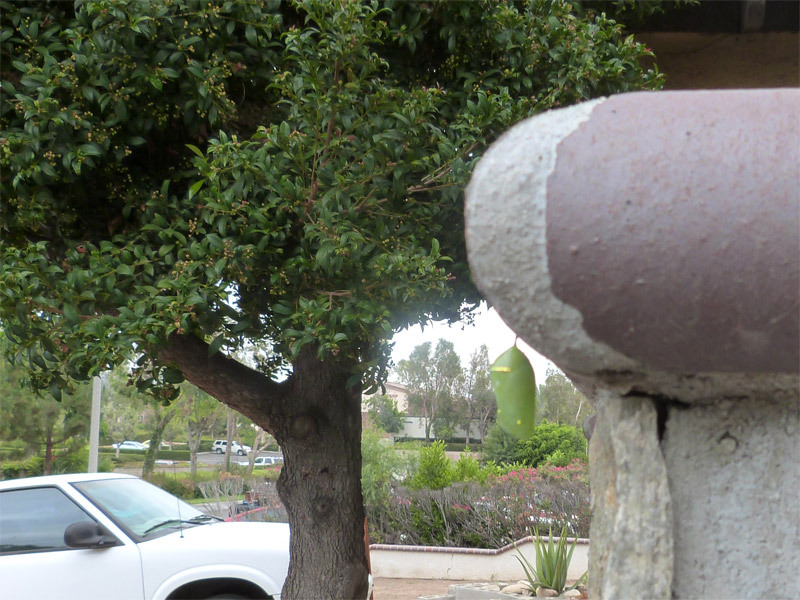 This caterpillar was attached to the stucco. 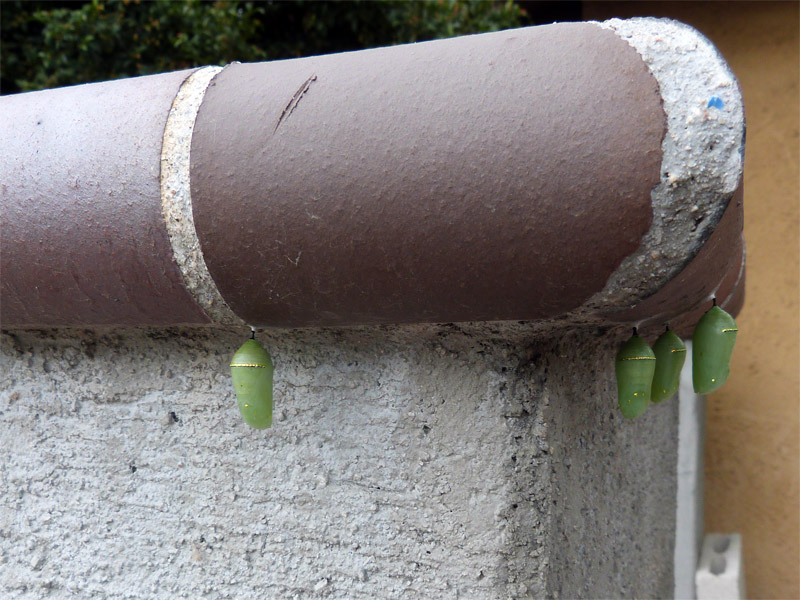 When he went through the process of forming the chrysalis, which involves a lot of twisting and turning, the roughness of the wall apparently tore his body apart. I found the remnants of his body and a dwarfed, misshapen chrysalis. The picture is kind of disturbing, and I won’t post it. 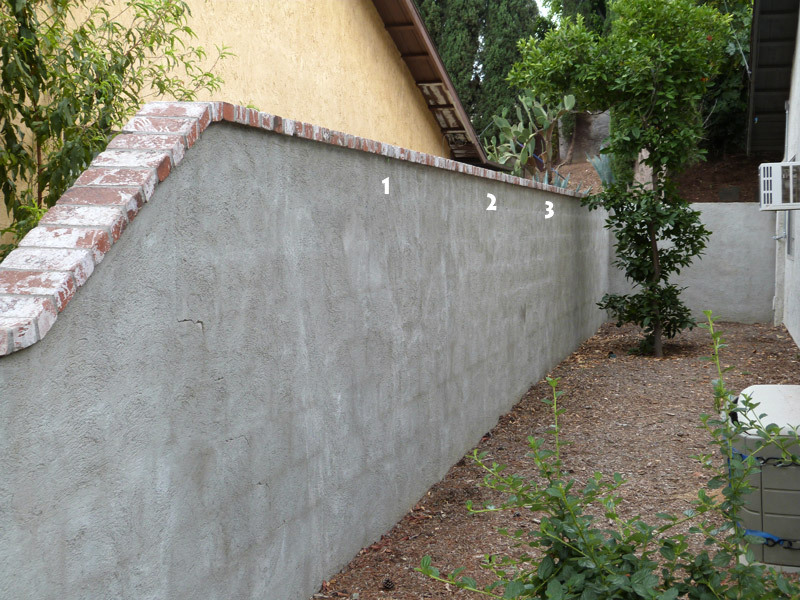 But I think next year I may put up trellises on that wall, so the caterpillars who end up on that wall will have an easier time of it. Hanging from the wall overhang. 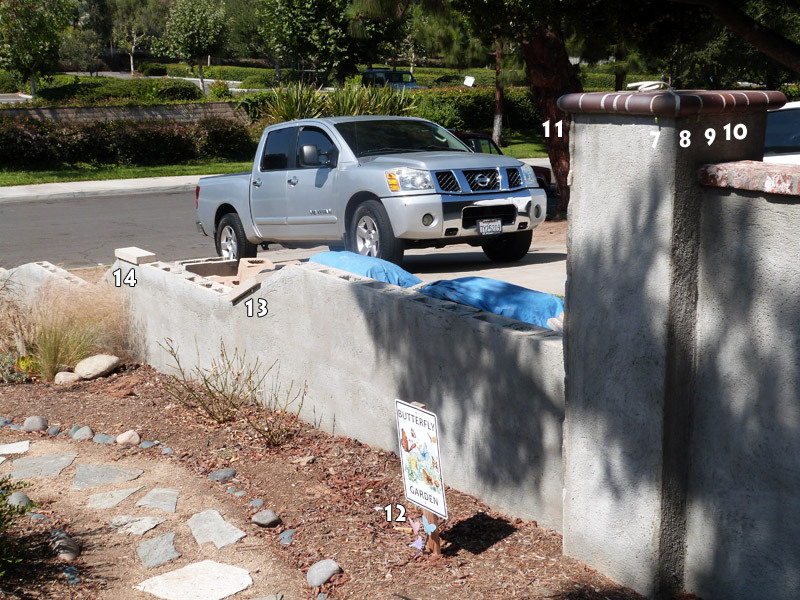 There was one behind the box near the bottom of the wall. 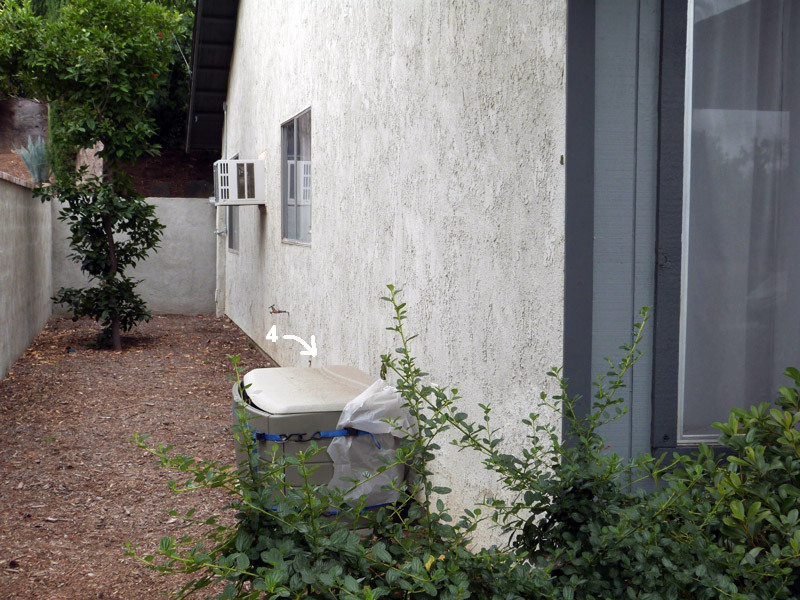 One attached himself to my neighbor’s potted plant. One pupated on one of my Asters. Five ended up on the wall post! One ended up — AGAIN! 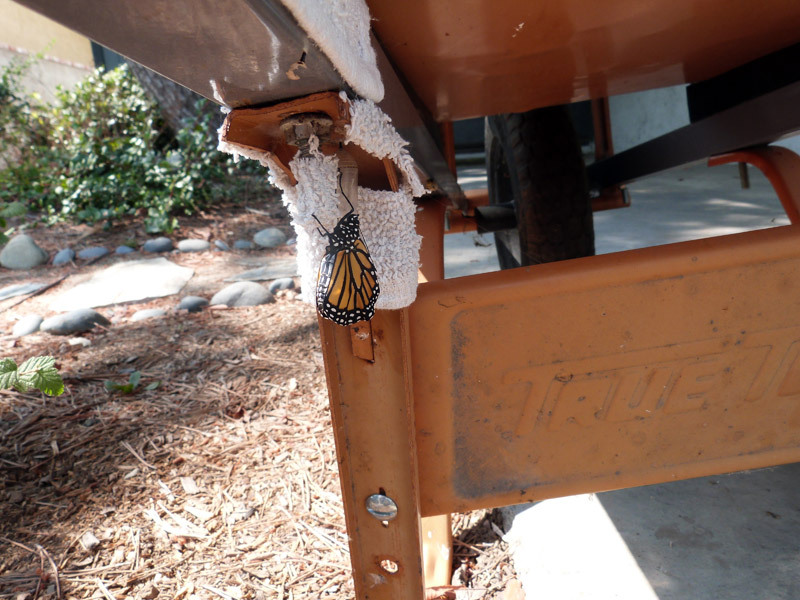 — on my wheelbarrow, and the other on the overhead beam. One crawled all the way to my Winifred Gilman sage. 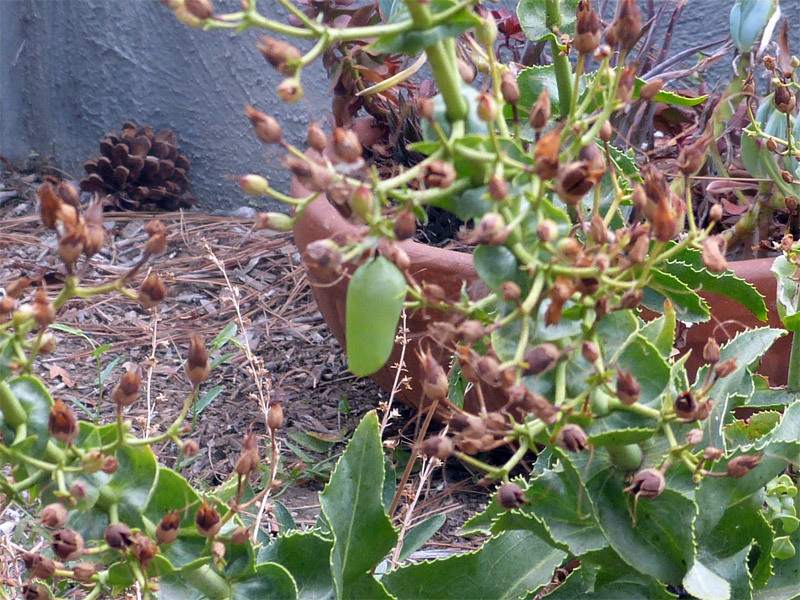 Last but not least, one found one of my Royal Penstemon plants. # 4, behind the box. The crowded four-plex on the corner of the wall post! The loner on the other corner. This guy must be able to read! 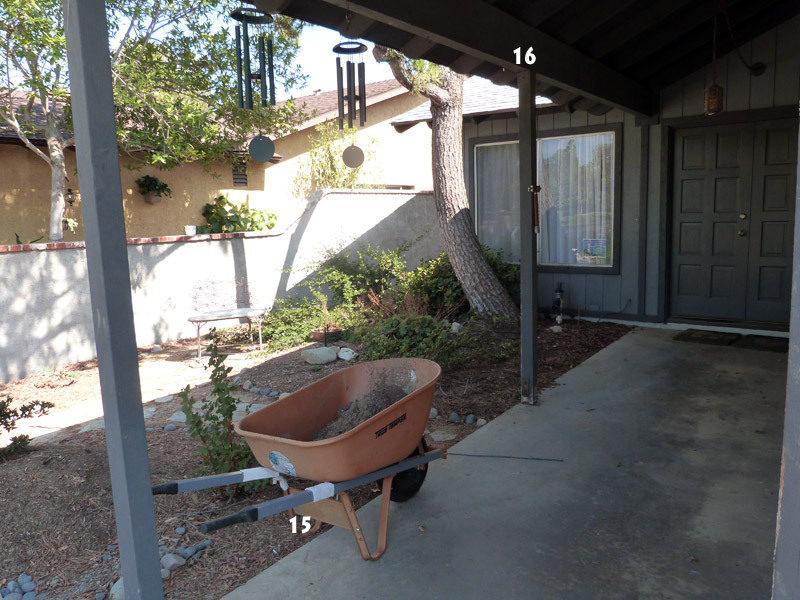 #15, on the other arm of the wheelbarrow. A tiny one on the Winifred Gilman. #18, on the Royal Penstemon. It’s probably not obvious, given that it’s hard to determine scale looking at these close-up pictures, but quite a number of these chrysalises are tiny — considerably smaller than normal chrysalises, reflecting the fact that many of these caterpillars, though ostensibly mature (officially, at the “5th instar”), were smaller than usual . The one on the Winifred Gilman is especially small, only about 3/4 inch long. Possibly it’s because of the extreme competition for food this time. 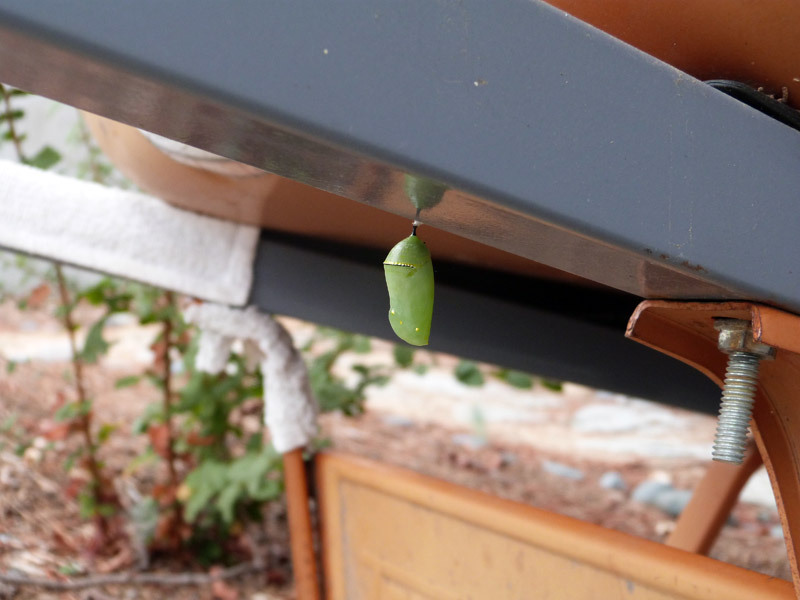 It will be interesting to see if the butterflies that emerge are correspondingly small. 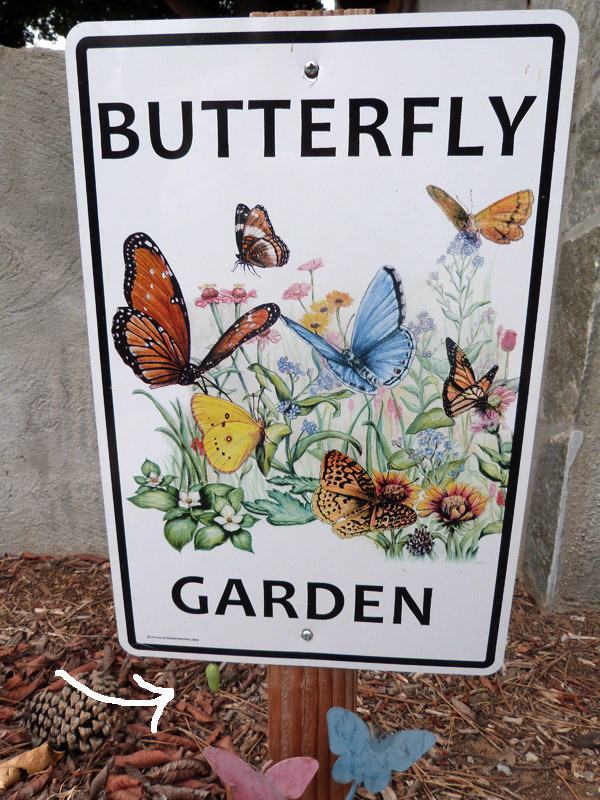 I expect these butterflies to make an appearance in the next week. That could be a crowded scene. Stay tuned! 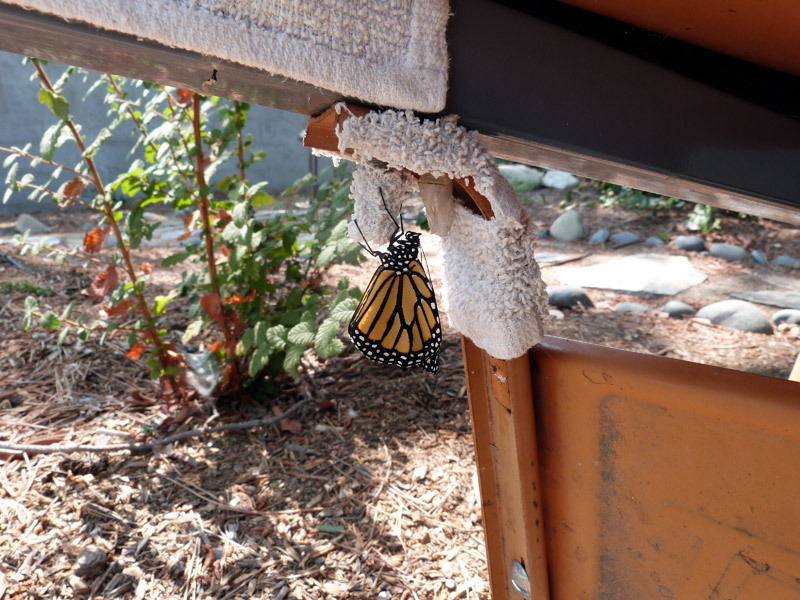 Last Friday the latest butterfly — the second one to pupate on my wheelbarrow — decided it was time to bring her gorgeous self out. 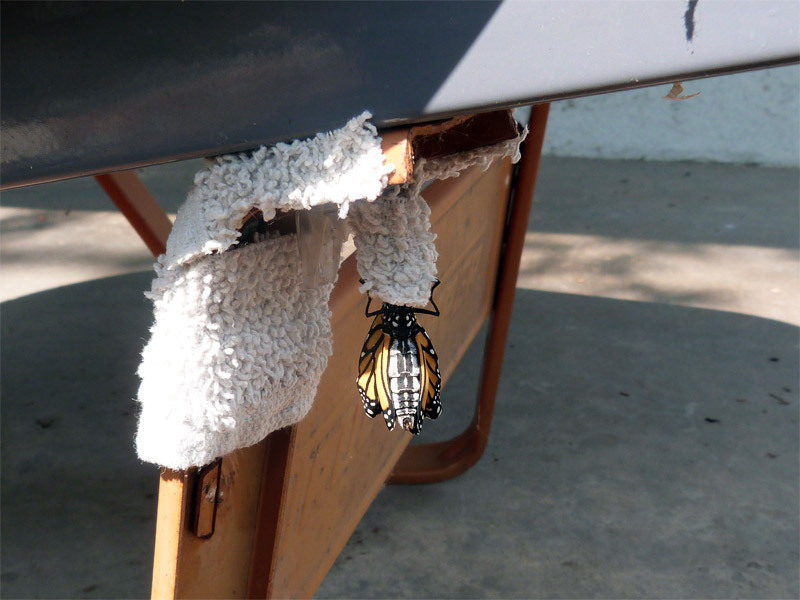 She stayed in more or less this state for a couple of hours, just sitting and allowing her wings to dry off and become stiff enough to be useful — and then she took off. 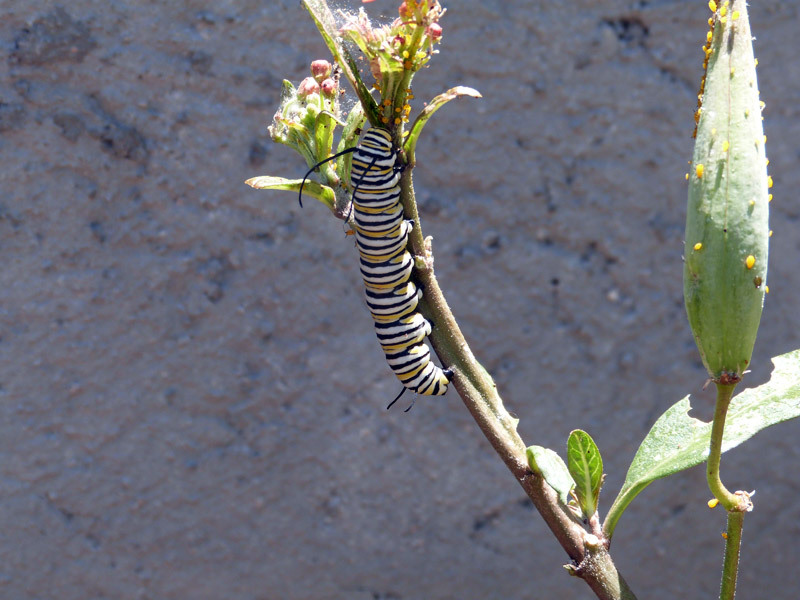 Another beautiful, healthy Monarch in the world! 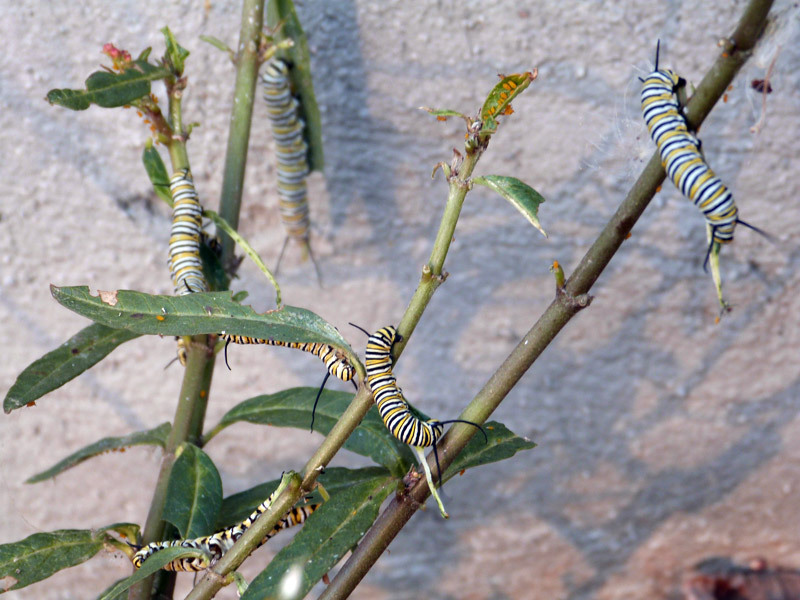 Tomorrow (I hope) I’ll begin telling the story of the 46 caterpillars (yes, 46!) 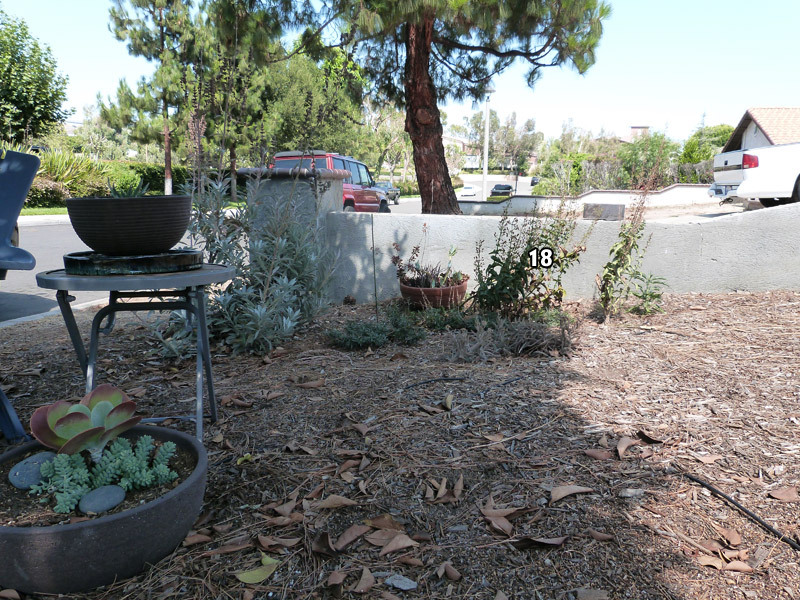 that populated my meager collection of milkweed plants! It won’t be long now before quite a few of them take off! Well, I thought the caterpillar season was “over” because the presence of the wasps would nip the population in the bud — decidedly not so! 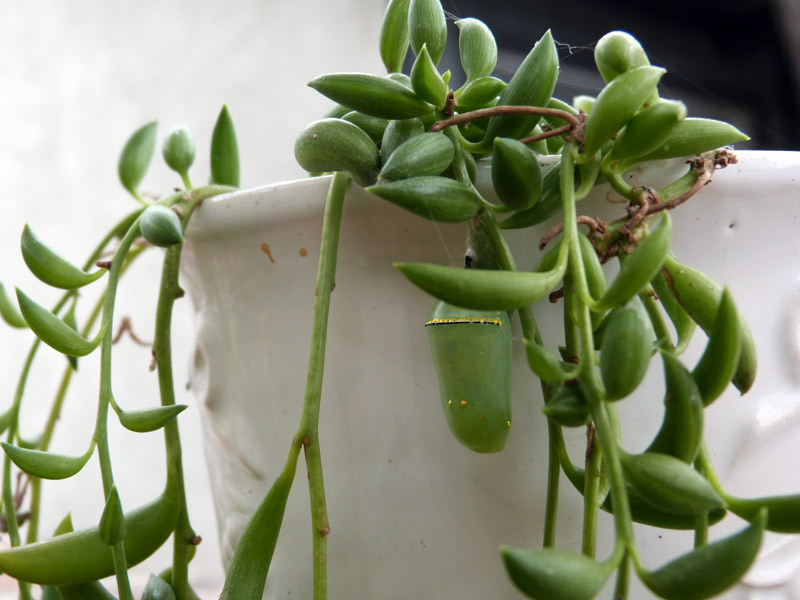 First off, there was a mature caterpillar a week or so ago who wandered off the plant to seek a suitable pupating spot just as I had to go to a doctor’s appointment — thus I missed seeing where he ended up. After I got back, I looked everywhere — or so I thought — and could not find him. 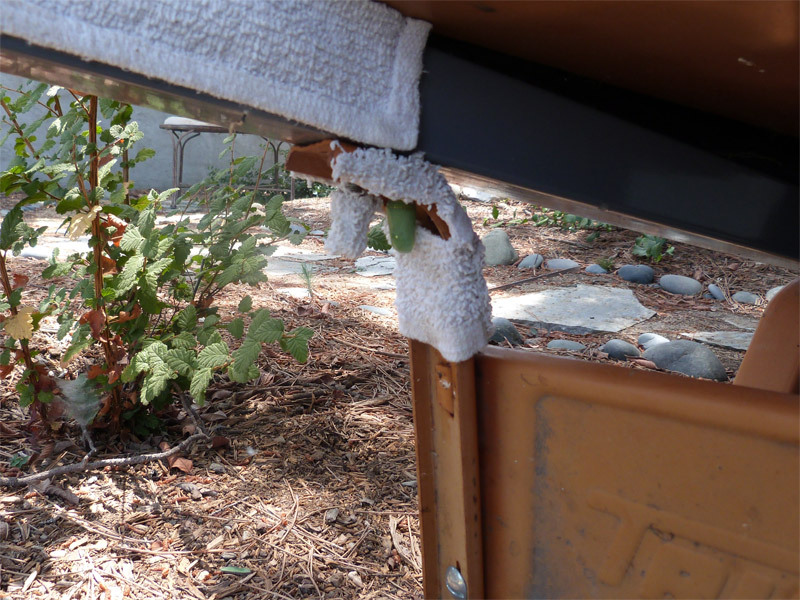 This picture shows the terrycloth I added around the pupating spot, because I feared that the metal would be too slick for the butterfly to get a purchase on, once it emerges. 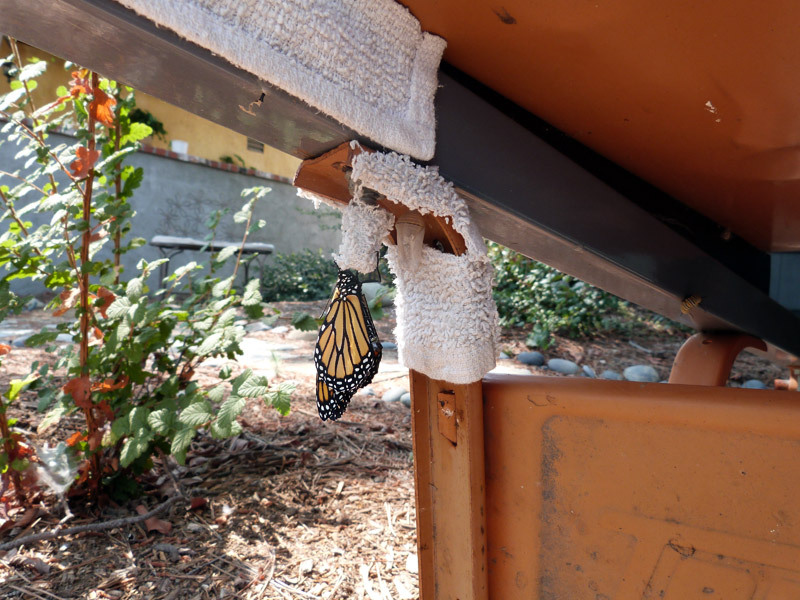 This caterpillar did not choose the best spot; newly emerged butterflies want to crawl UP after they have pumped up their wings while clinging to the spent chrysalis. 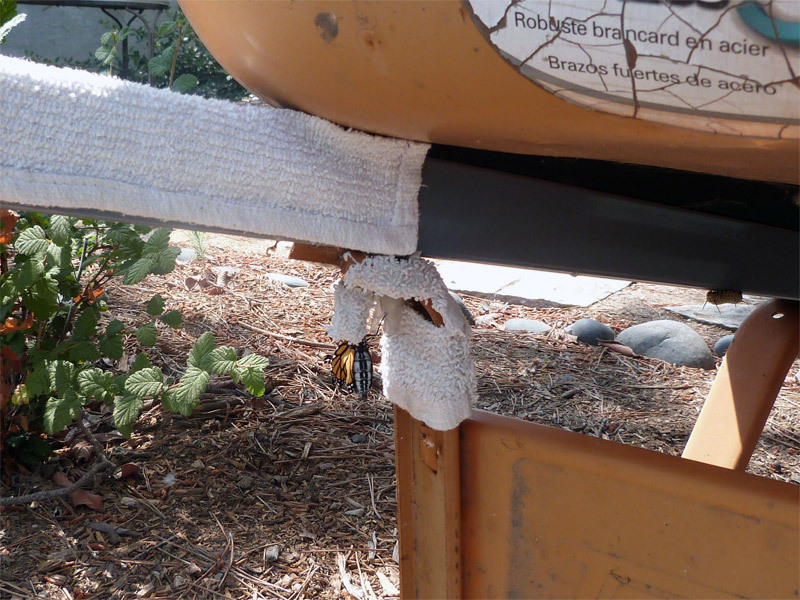 This position, inside the “groove” of the wheelbarrow leg, means the butterfly cannot go directly up; it will have to step to the side somehow. We’ll see how it goes. This one is probably the closest to maturity. Unfortunately, as I was checking out the caterpillar collection, I noticed one of the WASPS was on the plant — and eating one of my caterpillars! The poor thing was long dead, and the wasp was finishing his meal. I had in my hands a pair of scissors I had just been using to cut up the terrycloth, and I swiped them at the wasp, trying to cut him in two! Alas, he flew away. I am loath to surround the plants with netting as I did last year. 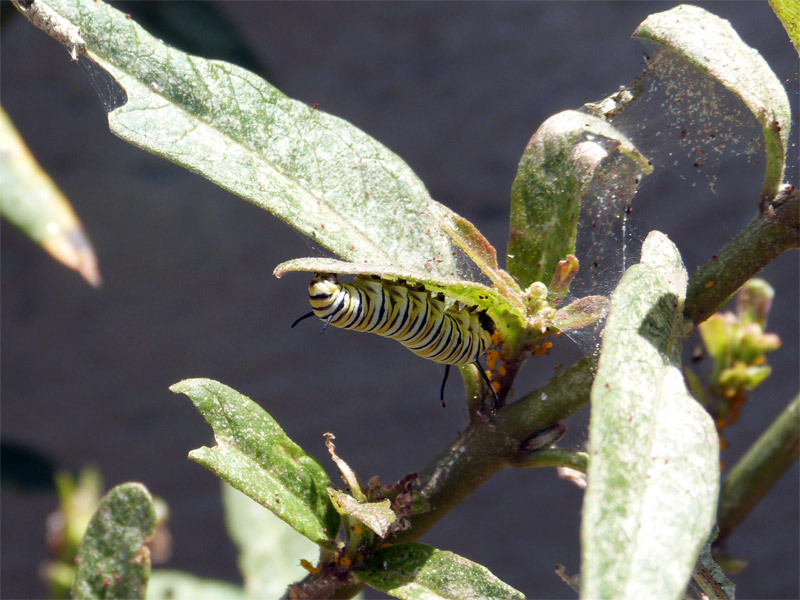 The caterpillars are all in different stages of development, and it would be difficult for the mature ones to escape the netting to seek a pupating location without removing the netting and endangering the others. So I am just going to monitor the situation. I’ve been checking the plants every few hours, and when I see a wasp I try once more to cut it with the scissors! I also have some wasp spray, but I don’t want to spray them when they are on or near the milkweed plants, lest the spray harm the caterpillars or contaminate the plants. No doubt some more will be lost. If it looks like the wasps are taking too many of them, I may reconsider on the netting. Just a quick update this time. 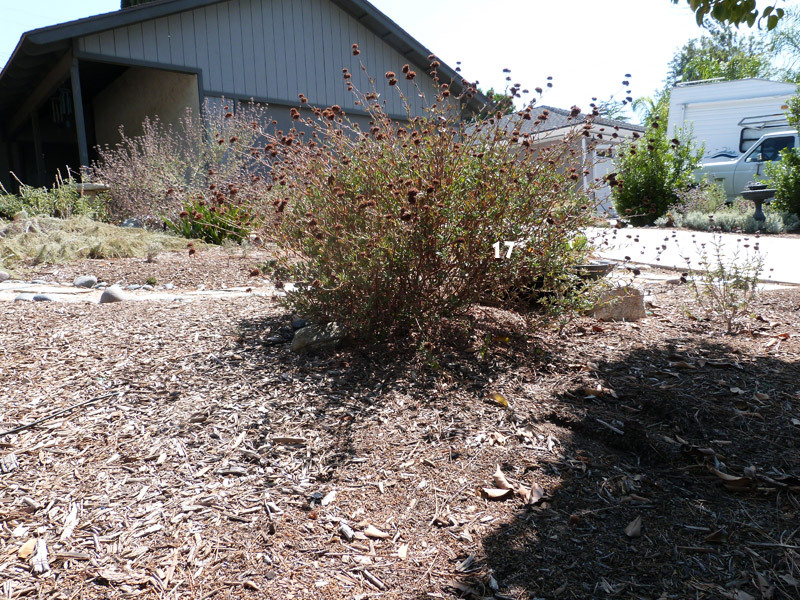 The garden is going into its summer dormancy and doesn’t look too great — the typical turn of events with California natives. For those who’ve been trained to think that a garden should always look green and have something blooming, this can be a hard phase. But this, after all, is the natural situation for our climate. 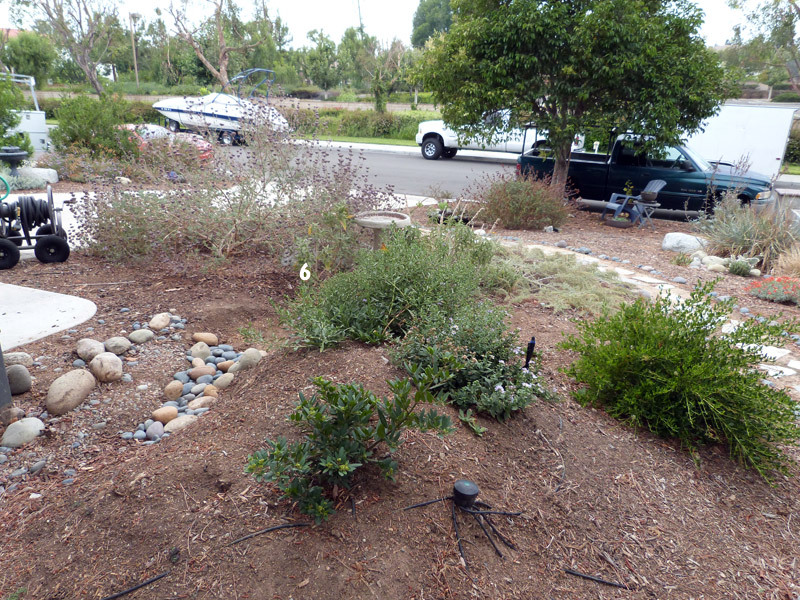 It’s so much better to keep things as close to their natural state as possible, and just give a little help (water-wise) so they don’t fall into a completely dry state. Learning to appreciate the natural stages of the flora and fauna of your environment makes you feel so much closer to it!